Praful Vasava of the Bhilistan Tiger Sena, an outfit that has been demanding a separate tribal state of Bhilistan to be carved out of Gujarat, went so far as to say that the three Gir communities were "fake tribals". Tapi, Gujarat: Over the past three months, tribal pockets in South Gujarat have seen small, sporadic protests against the state government with memorandums being submitted at the district collectorates. With the Assembly elections slated for December, Gujarat's Scheduled Tribes have been coming out to protest against three other communities - Rabari, Bharwad and Charan - seeking Scheduled Tribe status for their children who migrated out of the forest. These three pastoralist communities have traditionally settled in and around the Gir forest, far from South Gujarat in the Kathiawad peninsula. But their inclusion in the Schedule Tribe category has caused resentment to the "traditional" tribal communities such as Bhils, Vasavas and Gamits. Speaking to News 18, he said, "Tribals have a distinct culture. From our attire to our rituals and way of life, everything has a distinct characteristic. Rabari, Bharwad and Charans do not match with us and not every person who lives in a forest is an Adivasi. They are nomadic pastoralists who live around the Gir forest. They may be facing some problems, but that does not mean they should be given ST certificates." He added that this will end up causing harm to the "real" tribals. "All over India, there are about one crore people who get fake Scheduled Tribe certificates made and end up diluting the benefits that the genuine tribals should get. “Reserved jobs and seats that should go to real tribals end up with these fake tribals. The Rabari, Bharwad and Charan communities are actually OBCs and not STs. Why not give them reservations under the OBC quota?" The debate, however, is not a new one. According to Romel Sutariya of the Adivasi Kisan Sangharsh Morcha, the dispute dates back to 1956. “The issue is an old one but it is only after seeing the scale and impact of the Patidar agitation did these communities come out to protest. They have felt the need to protest for their rights too." With Gujarat Assembly polls just a month away, the ST status debate has taken a political colour and the Congress, which has traditionally had a stronghold over the Adivasis in Gujarat, has thrown its weight behind the "traditional" tribals. The BJP, that had distributed the new cards to the Gir communities, was forced to backtrack after the protests. Perhaps one of the reasons why neither party is willing to stand behind the Rabari, Bharwad and Charan communities is that together they make up for less than 2% of the state's entire tribal population. However, Gujarat Tribal Development Minister Ganpat Vasava does not see this as a U-turn. He said, "In October, the state government formed a committee and we received complaints that some ST cards were fake and it was decided that all mistakes would be corrected." He even went on to blame the Congress for this "confusion". "No state government has the right to include or exclude any community from the Scheduled Tribes list. That is the prerogative of the Centre. The Jawaharlal Nehru government included these communities as STs and the Manmohan Singh government included their children. We are constitutionally bound to implement that. The Congress has been trying to mislead the voters but that will not work." The Congress, however, hit back at the ruling BJP. 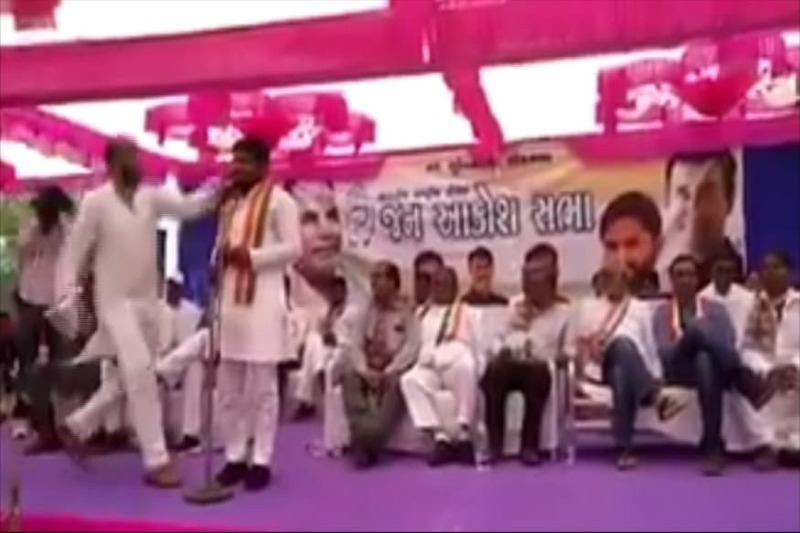 Congress MLA and tribal leader Anandbhai Chaudhari said, "There is a clear distinction in the UPA notification and the Gujarat government notification. The Manmohan Singh government said that only those whose parents lived in the forests would get ST cards but the Gujarat government has extended these rights to anyone who had an ancestor living in the forest. Ancestor can be anyone, even a great grandfather. We are not against Rabari, Bharwad and Charan communities. We want them to get benefits and improve their lives, however, it would be wrong to include them in the ST list." Activists, too, are not convinced with the BJP's reaction. Praful Vasava said, "The BJP government did not make their stand clear. All they said was that they would rectify their mistakes. There was no word on whether they will cancel all ID cards that were given to these communities. Unless political parties make their stand clear, they will end up suffering in the tribal belt during the election." With Assembly polls less than a month away and Gujarat's caste equation in a flux, both BJP and Congress will not want to upset the state's tribal population.